Let's start by making sure we're all on the same page about what this post is about. It is a pattern, created using multiple crystals, that is designed to amplify your intention. The crystals used in the grid are not random but are carefully chosen to create a harmonic relationship between the energies, shapes and colors of each crystal. The design is often based on Sacred Geometry and the basic patterns of life. Crystal grids can be designed and used for virtually any purpose. When the crystals are arranged properly, their energies are combined, amplified, and supported. Therefore your intention and specific needs can become focused and expands. The universe is infinitely complex and exceedingly simple at the same time. Everything in existence is composed of energy and matter that is built on a few fundamental design elements. There are several basic shapes and patterns of life that repeat in a seemingly endless combination of circles, squares and triangles that produce spheres, cubes, tetrahedrons and other 3-D forms. These patterns can be found on scales from molecular lattices to celestial galaxies. WHY WOULD I NEED TO USE MULTIPLE CRYSTALS? CAN'T I JUST USE ONE AT A TIME? Of course there are times when you could just use one crystal, and a grid isn’t necessary. However, there are other times when you need more and you would want to construct a crystal grid. 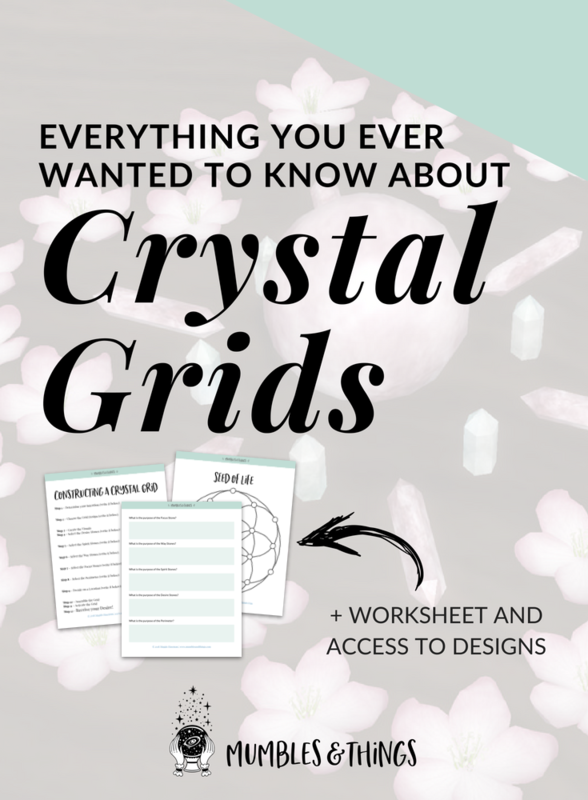 Grids offer a different type of energy that cannot be found in a single crystal. A grid is especially useful for when your intention needs a lot of power behind it in order to attract it to you. 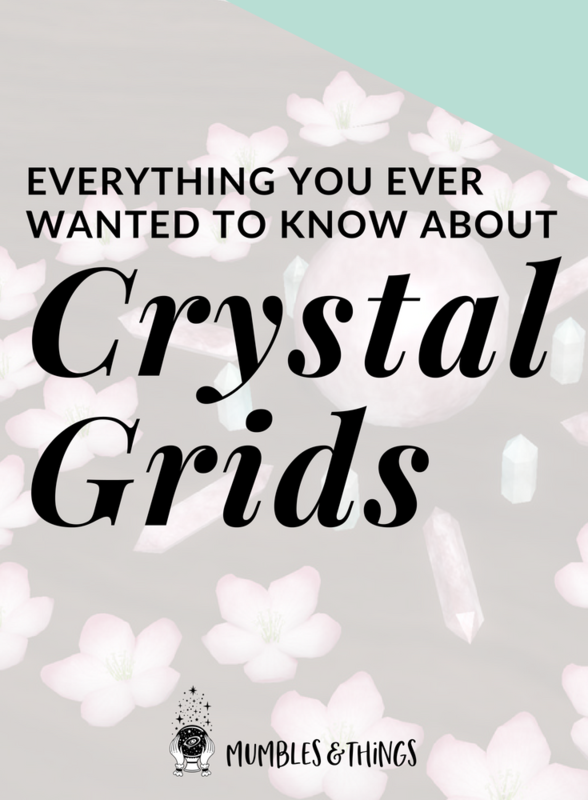 Grids use a number of standard parts that, when combined with knowledge and skill, can produce a powerful, synergistic combination of crystal energies. There are some guidelines to follow when combining and placing crystals for optimal results. Knowing which crystals to use, and where to place them on which grid pattern requires knowledge of the energies of crystals and of the universal patterns of life. The Path is the map of energy flow within the grid. The Design is selected to provide an energy path that is consistent with the objectives of the grid. The Visuals include design, color, and words or pictures that enrich the aesthetic and feeling you get when you encounter the grid. The Elements are the actual crystals including the Focus Stone, the Way Stones, the Spirit Stones, the Desire Stones, and the Perimeter. The Wand is a tool you use to activate the Grid. The path is pretty straightforward. This is the path that energy flows throughout the grid. A well designed grid will have a clear path for energy to follow so that it can be gathered and focused into one point. There are many designs that are useful for building grids. Many designs are based on Sacred Geometry and utilize basic shapes and forms. You can download and print all of these designs and several others as well in the Mumbles & Things Resource Library. You can enhance the aesthetic appeal of your crystal grid using certain visual features. The design ideas discussed above are just one visual aspect, below are several other ideas. COLOR: Use the color of the crystals to form patterns, or incorporate color in some other way to align with the purpose (flowers, images, colored text, candles, etc.). VISION BOARD: Build your grid on top of your vision board, or a vision board designed for whatever the purpose of the grid serves. Use pictures of health and wellness, wealth and prosperity, happy and loving relationships, or the career or lifestyle you want. AFFIRMATIONS: Write an affirmation specifically for the purpose of your crystal grid to draw the intention into the physical realm and support the efforts of the grid. There are also several elements involved in the creation of a crystal grid: The focus stone, the way stones, the spirit stones, the desire stones and the perimeter. Choose all of the crystals in your grid based on their ability to focus and amplify the energy from your spiritual source for your specific purpose. This decision will depend on the crystals color, influence, and shape. the Spirit Stones invite the help of a particular spirit, and gives life to our crystal grids. and the Perimeter contains the energy and protects it. Each piece plays an important part, and the interaction of a well-constructed grid can bring you the energy and power you need to improve and enrich your lives and the lives of others. A wand is used to activate the grid. Draw the direction of flow and allow your mind and your intentions to connect the energy path of the grid. There are many different options for your wand. There are places where you can purchase one, however, it can be very magical to make your own. A small twig from a tree, especially if it’s a tree with magical properties similar to the grids purpose. A crystal or several attached to the end of a stick. Quartz crystal is generally used for this purpose but it can be useful to use the same crystal as the ones you are using for your Desire Stones. Now the you understand all the components of a crystal grid you can create one for your own purposes and desires. Follow these simple steps. We’ve talked a lot of intentions before. It must be specific and clear. And it should be presented in the present tense. The second step is to match the intention and objective of the need to the various designs of grids. Use pictures if your desire is tangible. If it’s more abstract, use affirmations. The visuals can also include a print out of the design you chose in step two. At this step you can start thinking about a color scheme as well that harmonizes with your intention. When deciding on the stone you want to use, start from the outside and go in. The Desire Stones are often the easiest to select because they are the most connected with your intention. Pay attention to the color as well if you chose a pallette during step three. If you are seeking spiritual help and guidance select the Spirit Stones after selecting the Desire Stones. The Way Stones require a more scientific approach to select because they amplify, remove obstacles and generally show you the way. Ask yourself what steps need to be completed to get from point A to point B and what challenges you may face on the way. Then choose Way Stones with energy that aligns with this or are a color attuned to the answer. The Focus Stone collects, aligns, and focuses the source energy in order to bring its healing, life-giving properties to your grid. Choose stones with the ability to do with. Shape and size are also things to consider. Often times it’s best to select this stone based on what feels right. Try several options and it will be clear which one to use. This of the perimeter as the walls of a castle: containing and protecting. Crystals that are known for protection are a good place to start when building the perimeter. The location is important, especially if you want the grid to stay up for several days. Energy should flow freely in the space you choose, so under the bed or in a closet are not good choices. Consider pets and children as well when deciding on the location. Begin laying out crystals according to the design and elements you have chosen. You may wish to align your grid with the magnetic field of the earth as if it were a compass. Activate the grid using your wand. Connect your intention to the energy path within the grid by tracing the path of energy flow. Close your eyes and connect to your spiritual sky boss through whatever meditation technique you prefer. Pull the energy from the universe inward and allow it to flow through the tip of the wand into the Focus Stone. Visualize it traveling to and activating the Way Stones, Spirit Stones and out to the Desire Stones. The grid is ready to assist you in your desire! Realign yourself as someone who has already received their desire. Visualize yourself having what you want and feel the emotions associated with this. Do you use crystal grids? What's your favorite design? Tell me below in the comments.